This is an aromatic ointment for aches and pains from rheumatism or trauma. White Flower Oil can be used for headache by applying topically to the temples or to relieve congestion by applying to the sides of the nose. White Flower Oil can be used as a topical liniment for wind cold damp bi syndrome that causes stiffness, sore muscles or poor circulation. It can be applied to the joints and low back. 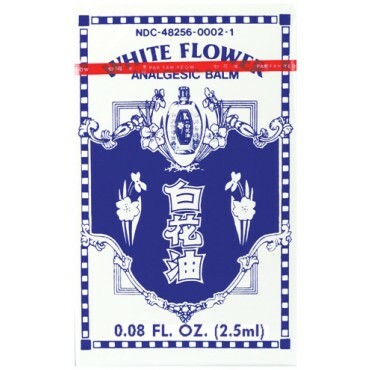 White Flower Oil has been helpful to dispel blood stasis in traumatic injuries and swellings. White Flower Oil is useful for arthritis, bruises, lumbar pain, neuralgia, rheumatism and traumatic swelling. White Flower Oil is also useful as a liniment for massage and to relieve nasal congestion or nasal headache. Gaultheria probumbens, Lavendula angustifolia oil, Eucalyptus globulus leaf-oil, Menthol, Camphor, Unlisted proprietary ingredients - Dong lu you, Fen yi cao you, You jia li you, Bo he nao, Zhang nao, Unlisted proprietary ingredients. Moves qi, invigorates blood, dredges and opens channels and collaterals, relieves pain. Anyone with aches and pains caused by rheumatism or trauma. Apply to affected areas, 3 x per day. Each bottle contains 20 milliliters. For external use only. Certain skin sensitive individuals may react to this product. If a heat or itching reaction should occur, remove the oil. Do not cover the skin with plastic after application of White Flower Oil. Do not apply to open wounds and avoid contact with the eyes. Do not apply to the lower abdomen or lumbar vertebrae during pregnancy.